What do you want to eat? Maybe the question should be what do you want to cook? At this time of year with the seasons changing and a chill sometimes seeping in through any gap it can find, you may be looking for comfort in a bowl. This particular bowl of comfort also has the added benefits of being quick, simple and cheap. The latter of course depending on how in-season broccoli is for you, whether your pesto and parmesan are gourmet or own-brand and yes the humble rasher of bacon too could veer towards expensive if you are wont to artisanal produce. Well each to their own on that front, only a food snob would judge you by your choice of ingredients and boy do they exist. Regardless of provenance I guarantee that the end result will be delicious. Fill up a large saucepan with boiling water and bring it back to the boil. Prepare the broccoli by giving it a quick rinse and breaking it up into florets and set aside. Peel and crush the garlic and set aside. Rinse and slice the cherry tomatoes in half and set aside. Cook the spaghetti in the boiling water for 6* minutes, while gently frying the rashers in a frying pan in 1 tablespoon of the olive oil. Occasionally stir the spaghetti so that it does not stick together. After 6* minutes, add the broccoli florets to the spaghetti and cook for a further 2 minutes. Meanwhile, add the other tablespoon of olive oil to the rashers and add in the crushed garlic and halved cherry tomatoes. After a total cooking time of 8* minutes drain the spaghetti and broccoli, retaining about a half a cup of the cooking water. 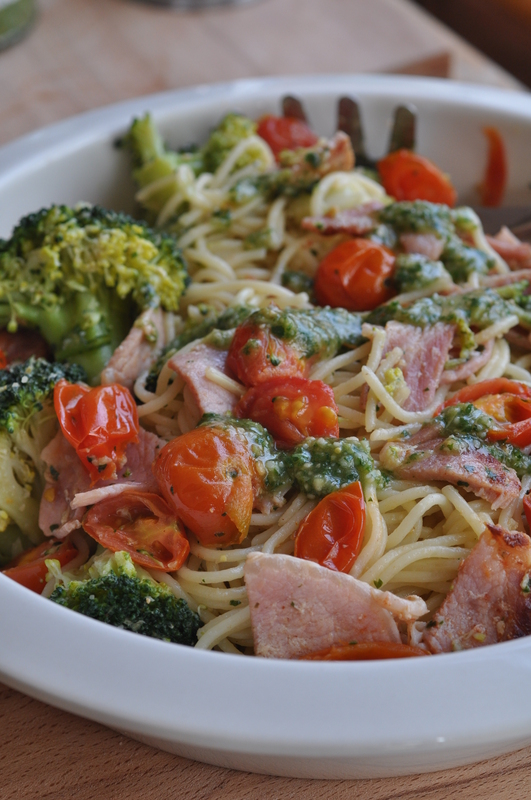 Roughly chop the rashers in the pan and then stir the rashers, garlic and cherry tomato mix into the spaghetti and broccoli. 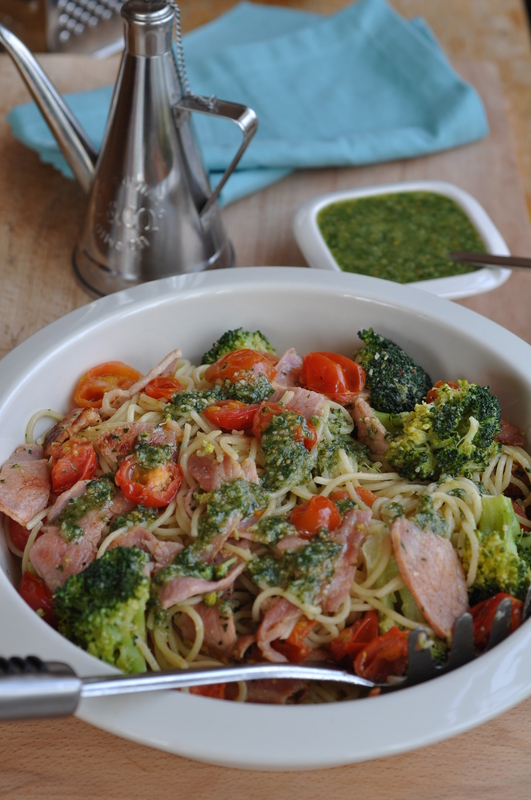 Stir in the pesto and enough of the reserved cooking water to moisten. Serve hot with some extra pesto and grated Parmesan. Very healthy and tasty, I’ll bet.